Our mission is to help students achieve college success with Sophia Pathways, our affordable, flexible, competency-based online courses. These self-paced courses cost a fraction of traditional college courses, and are accessible anytime, from any device. As part of our ongoing commitment to learning, we also provide free college readiness resources for students, including test prep and refresher courses, as well as professional development resources for teachers. Not only do our online college level courses cost much less than traditional courses, there are also no textbooks to buy and you never have to miss work to take a test or attend class. Designed to be affordable and accessible to students at every stage of their educational career, our courses make it easy to streamline work, life and education, so you can earn a college degree in a way that works best for you. We know teachers are the heart of a great educational experience. That's why we offer the tools, technology and inspiration you need to keep both your classes and your career vibrant and exciting. 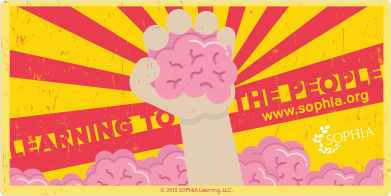 From creative ways to enhance your online courses and flipped classroom/tablet certification programs to Common Core-aligned content and supportive peer forums, Sophia offers a wealth of free resources to help you stay on top of, and get the most out of, online teaching. Whether you're preparing for college, looking for refresher courses, or ready to enroll in self-paced college level courses, we have everything you need to take the next step on your educational path. With amazing teachers, supportive coaches and thousands of free tutorials designed to appeal to all kinds of learning styles, we've created a vibrant online learning environment that listens to individual needs and values every student's success. The Distance Education Accreditation Commission (DEAC) has approved all 15 Sophia's courses for Approved Quality Curriculum (AQC) status. For more than 89 years, DEAC has operated as a national accreditor of distance education institutions and was the first to establish a distinctive process for evaluating curriculum offered outside of the traditional academic domain of higher education institutions. The DEAC is recognized by the Council for Higher Education Accreditation and the U.S. Department of Education as a reliable authority on quality assessment of distance education. Learn more about Sophia’s DEAC-approved courses. If you have any questions, please call us at 1-800-341-0327. Transferman is ready to leap into action! At no cost to you, Transferman will use his superpowers to find out if your credits will transfer to the school of your choice. Just tell him the course or courses you'd like to take and your preferred school, and he'll get you an answer fast. How super is that? Share your info below and we'll respond promptly. Sophia students have been pre-approved for credit transfer, or had their Sophia courses accepted for credit by the following institutions. This list is not intended as a guarantee of transfer. Schools accept credit transfer on a case-by-case basis and decisions may vary by student and specific degree plan. We recommend you download the course syllabus and ask your school to review it for pre-approval of transfer credit. Please contact the Sophia Learning Coaches for more information on credit transfer.